Here’s another gate that control the amount of light that enters your camera sensor; SHUTTER SPEED!! Shutter speed shows the duration the shutter is left open to allow light passing through the lens, then enter into the camera, and hit the image sensor. BAM! You produce an image. Congratulations! So, with a fast shutter speed, this duration is short and less light enters the camera while with a slow shutter speed, the duration is relatively longer and more light can get into the camera. Simple enough! Shutter speed is measured in seconds. Do note that although in reality the speed is 1/500 s, the camera displays 500 at the top LCD. And the other values are like I’ve shown in the above picture. The reason behind this, the space is not enough to write “1/” at each shutter speed. LOL. But wait, what is bulb? You meet ‘bulb’ after you hit 30 s. Normally, bulb mode is used when you need to use shutter speed longer than 30s, preferably for long exposure photography. Well, the name says it. So the bulb mode functions like this; You press and hold the shutter button, the shutter opens and when you release the button, the shutter closes. So, the shutter opens for as long as you hold the shutter button. It can be any seconds or minutes, you name it. Try and test it yourself! This is the primary reason you vary shutter speed; to create a sense of motion in your picture. Shutter speed does two jobs. It creates frozen motion and blurred motion. When you shoot a moving subject, its motion is recorded by the camera throughout the exposure time. With a fast shutter speed, this exposure time is short, so hardly any motion gets recorded and your subject appears frozen. But with a slow shutter speed, lots of motion gets recorded. This can yield some beautiful motion blur, such as misty water effect or wooshy cloud. Shutter speed does two jobs. It creates frozen motion and blurred motion. So, onto the next, in what situation should you freeze the motion or blur the motion? Normally, people use fast shutter speed (1/500 s or faster) when they shoot action, particularly sports or wildlife photography, where every parts of the subject are needed to be in focus. 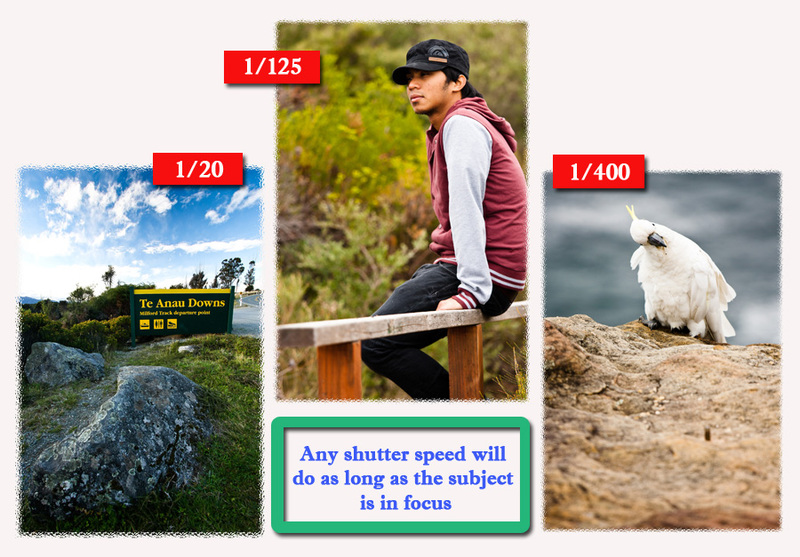 Shutter speed in the range of 1/15 s to 1/500 s is for general shooting photography, like street, indoor, portrait or landscape which your subject does not move too quick. Any shutter speed slower than 1/15 s is used when you do night landscape photography or record the effect of the motion, such as waterfall or light trail. So, if you feel the subject’s motion needs to be frozen, use fast shutter speed and vice versa. At any particular ISO speed, exposure is determined by the combination of aperture and shutter speed. To maintain the same exposure, if the shutter speed is slowed down by 1 stop, then the aperture must be closed by one stop. Here’s an example. You decide to take a photo of waterfall and the correct exposure is shutter speed of 1/30 s and aperture of f8. But then, you notice the shutter speed is not slow enough to blur the water movement in order to create smooth misty effect. So, you opt for slower shutter speed and you choose 1/15 s. So now, what is your aperture going to be? First of all, the definition of 1 stop. Slow down the shutter speed by 1 stop means reducing the light enters to your camera by half. So, if it is 2 stops, double the amount then. 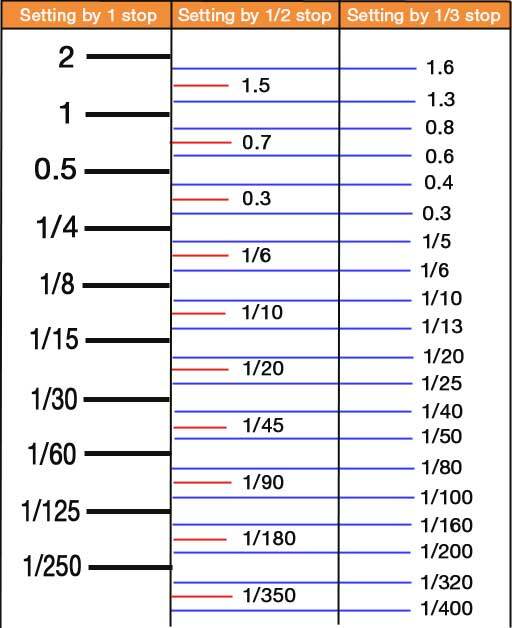 At any particular ISO speed, exposure is determined by the combination of aperture and shutter speed. So, back to the main question. going from 1/30 s to 1/15 s means you reduce the shutter speed by 1 stop (more light gets into the camera). To compensate for this, you have to close the aperture, so less light can enter the camera, but how much? By 1 stop too. So, closing the aperture of f8 by 1 stop is going to be f11. If you don’t understand the aperture progression, you can refer to my aperture post. There is a trick to remember this so complicated increasing and reducing shutter speed and aperture. First, check your camera dial. From 1/30, how many times do you have to turn the dial to get 1/60? It should be either 2 or 3 times but normal camera setting needs 3. So here is the trick. The number of times you should turn your shutter speed dial is the same as aperture dial but opposite direction. So, if you turn the shutter speed dial 3 times to the left, you have to turn the aperture dial 3 times to the right. Then, you still retain the same exposure but the motion gets more blurred. Yay! Shooting a fast moving object requires fast shutter speed. Try to use as fast shutter speed as you can without underexposing the image. If the image is underexposed, try to use big aperture or increase the ISO. For normal shooting purpose, slow shutter speed can induce camera shake and your image will be totally blurred, and it is bad. As a general rule of thumb, the shutter speed should be 1/focal length. So, if you shoot at 70 mm, the shutter speed should be at least 1/70 s. However, there is a breathing technique that you should learn if you really want to shoot at slower shutter speed. So here it is. You breathe in as normal, then after you breathe out, hold your breath, and click! And try to limit your movement as much as you can. However, you can use a tripod or monopod for better support. To shoot at very low shutter speed like 1/15 s or below, I recommend you should use a tripod, or a monopod. There is no way you can capture sharp images at very low shutter speed without these equipment, although you may place your camera on any good surface. I find this website to be useful if you wish to look for more information and example in shutter speed. Start the day with your camera mode set to [Tv] (Canon) or [S] (Nikon). It stands for shutter priority value, which means you set the shutter speed while the camera itself does the setting for aperture. Make sure the exposure level is set at zero. To do this, hold down the Exposure Compensation button and turn the main dial or you can half press the shutter button and turn the main dial. Look for a static moving subject, such as water fountain or a fan. Try to do this in bright area so you could able to use 1/500 s. But if you can’t do that, pump up the ISO as high as you can. From the images you captured, make comparison between all of them. Does the subject freeze? Or the subject produces blurred motion? Do experiments, so you can achieve your desired movement effect of the subject. For most shooting purposes, the goal of setting the right shutter speed is to keep the subject in focus so the image will be sharp. Variation in shutter speeds will allow you to freeze or blur the motion of the subject. Last but not least, have fun with photography. whoah this is excellent i really like studying your articles.